WASHINGTON, DC — Today, Global Zero released a comprehensive alternative plan in response to the Trump administration’s Nuclear Posture Review issued earlier this year, which seeks to expand U.S. nuclear capabilities and loosen restrictions on their use. Global Zero’s Nuclear Posture Review, developed in partnership with Princeton University by nuclear command-and-control expert and veteran nuclear launch officer Dr. Bruce G. Blair, offers a credible new vision for the size, composition and deployment of U.S. nuclear forces based on actual Pentagon mission requirements. In contrast to the administration’s proposed expansion and accompanying nuclear warfighting plans, the report calls for the United States to shift to a deterrence-only posture, adopt a policy of no first use of nuclear weapons, de-alert nuclear weapons and end the practice of launch-on-warning. Global Zero’s alternative Nuclear Posture Review, endorsed by former Vice Chairman of the Joint Chiefs General (ret.) James E. Cartwright and former Under Secretary of State Ambassador Thomas Pickering, offers a bottom-up assessment of actual U.S. national security needs. The result is a reduced U.S. nuclear arsenal that would still meet demands for a credible nuclear deterrent, pending the total elimination of nuclear weapons globally. Through better integration of conventional and cyber de-escalatory options in strategic planning, canceling plans for dangerous new weapons and unnecessary upgrades, and strengthening vulnerable nuclear command, control and communications networks, the report illustrates how the United States can reduce the risk of nuclear weapon use by accident, miscalculation, launch on a false warning, or rapid conflict escalation — all while saving American taxpayers billions in unnecessary weapons programs. Our recommendations will strengthen control over nuclear operations and reduce the risk of their use by design or accident while maintaining a robust and stable deterrent force and promoting deep reductions in the world's nuclear stockpile. Withdrawing B61 tactical nuclear weapons from Europe, placing them in central storage in the United States. “This report finds that the current U.S. nuclear modernization plan will deploy at least twice as many nuclear weapons than needed to meet the Pentagon’s own mission and target requirements, many hundreds of which will be vulnerable “use or lose” forces that would further destabilize a crisis and increase the risk of a nuclear conflict. Our recommendations will strengthen control over nuclear operations and reduce the risk of their use by design or accident while maintaining a robust and stable deterrent force and promoting deep reductions in the world’s nuclear stockpile., said report author and Global Zero Co-Founder Dr. Bruce G. Blair. 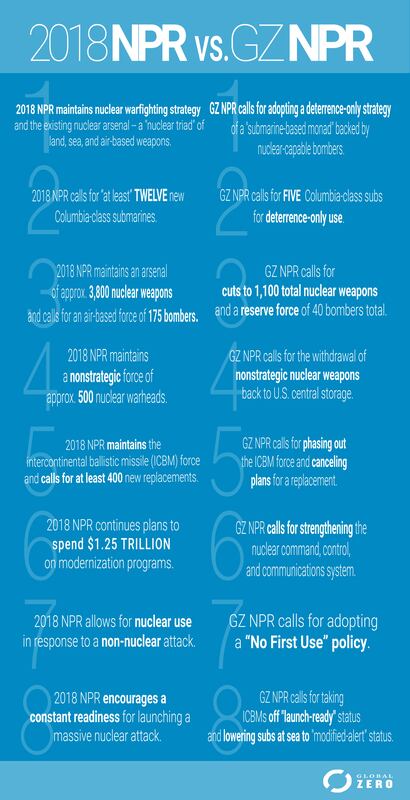 “Trump’s NPR is a throwback strategy that would see America go gangbusters on nuclear capabilities, to the tune of nearly $2 trillion. More is not necessarily better. Global Zero’s alt-NPR conclusively demonstrates that we can satisfy even the Pentagon’s deterrence requirements with far fewer weapons, at far less risk, for far less dough. It’s a no-brainer: Every sitting member of Congress should examine this plan closely and insist we pursue the safer, saner alternative,” said Derek Johnson, Executive Director of Global Zero. For more information or to speak with Global Zero leaders, please contact Jordan Wilhelmi at +1-612-281-2310 or by email at [email protected].